Note: This is the first in a new series of articles about the way plagiarism is represented in pop culture, highlighting various stories in TV, books and literature that deal with the topic. I’m hoping to get a wide variety of sources, in particular different time periods, to show the ways that attitudes about plagiarism have changed. If you have recommendations for good additions to the series, please let me know. 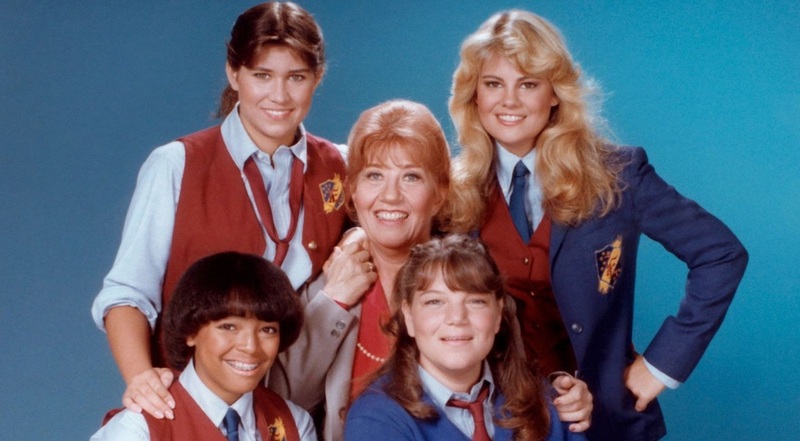 The Facts of Life is a TV sitcom that ran from 1979 to 1988 and saw over 200 episodes. Centering on the events at a dormitory at the fictional Eastland School (a private all-girls school in New York), the show focused on Edna Garrett, the housemother of the dorm, and the girls under her care. The show itself consistently dealt with difficult topics including eating disorders, race, drugs and other issues that face teens. It rarely shied away from difficult conversations or life lessons and became a huge success for its mix of social commentary and comedy. However, it was very early in the show’s run that the topic of plagiarism was raised. In the sixth (or fifth in some guides) episode of the first season, entitled Emily Dickinson, plagiarism came Eastland School and, along with it, some lessons about honesty and integrity. Just as you would expect from The Facts of Life. At the beginning of the episode, Steven Bradley, the school’s headmaster, shows up at the dorm to remind the girls, almost all of whom are watching TV, that their poetry assignment is due the next day. While he’s there, Blair returns home from a night of “rehearsing” with her new boyfriend and Romeo & Juliet co-star Josh. When pressed about her poem, Blair says she has it in her head but needs to write it down. However, when she goes up to do so, she struggles to even get started. There, at the advice of another one of the girls, Tootie, she she begins seeking inspiration from a book of Emily Dickinson poetry. However, after reading one poem, she decided it sounded like something she would write if she had the time. Tootie presses her, saying that it’s cheating but Blair says she’s not copying from someone else in the class, but rather, someone who has been dead nearly 100 years at that point. Despite her protests, Tootie is motivated to keep quiet after Blair bribes her by agreeing to do some of her chores. Blair then copies the poem, supposedly with some changes, and then turns it in. When the girls get their grades back, Mr. Bradley gives Blair an A+ but docks all of the other girls because, according to him, he was grading on a curve. It was at this point Blair began to feel guilty about her misdeed and only to have it worsened when Mr. Bradley tells her that he’s already submitted her poem to a local poetry festival. Eventually overcome by guilt, Blair confesses the misdeed to Mrs. Garrett and later to the other girls. However, Mr. Bradley’s enthusiasm for the poem makes it difficult for Blair to tell him, especially considering the poem won 3rd prize at the festival. However, Mrs. Garrett steps in and forces Mr. Bradley to listen to Blair’s confession. Flustered by the plagiarism, Mr. Bradley still listened to an original work created by Blair. However, that poem, which focused on the guilt and self-loathing the lie had caused, didn’t dissuade him from issuing a harsh punishment: Forcing Blair to drop out of the play, grounding her for a month and failing her in English class. While the punishment is harsh (and the other girls say as such) Blair seems content because the guilt is lifted from her shoulders and she is able to love herself again, as her character is wont to do. Overall, the story does a decent job of showing just how some students get caught up in plagiarism. Blair, despite being well aware of the assignment, loses herself with other aspects of her life and puts it off until the night before and then finds it impossible to complete. Knowing that the assignment is a significant part of her grade, she gets desperate and turns to plagiarism, even justifying away her actions as she’s doing it. However, even in 1980, it’s unlikely that Blair would have made it far enough with the falsehood to turn herself in. Plagiarizing a poem from one of the world’s most famous poets and one whose complete works is only 172 pages long, would likely have gotten her caught even without the aid of originality detecting software. In short, even if Mr. Bradley had failed to catch the plagiarism, it’s almost certain that the poetry festival would have. The episode also shines a very strong light on how plagiarism impacts others in the class. Though it’s highly unlikely that an instructor would grade poems against one another, especially when students are not all the same age, it shows that Blair gained an unfair advantage over her colleagues and her fellow students are appropriately upset when they learn about the misdeed. Finally, while the punishment is harsh, it’s also not unbelievable or unreasonable. Blair is high school aged and the plagiarism was a deliberate one on a major assignment in a core class. Many high schools have guidelines that call for failing a class after a serious plagiarism incident, meaning that the outcome is far from outlandish, especially at a private school. While the episode definitely plays around with realism a bit to keep the plot going (otherwise we’d never see Blair’s redemption), it overall portrays the challenges students and instructors alike face when it comes to plagiarism. It also serves as a great warning about plagiarism, even if the show itself hasn’t always aged well. As I was researching this episode, I learned that the plot to this episode was eerily familiar to at least some TV viewers. In 1958, for episode 1 of season 2, the show Leave it to Beaver did an episode in which Beaver turns in a plagiarized poem for a class assignment. In this case, rather than lifting from Emily Dickinson, Beaver used a poem written by his father and ends up winning a poetry contest with it. Needless to say, I’ll be covering this episode later (after I’ve been able to see it) but the episode clearly has some differences, including that, in the Leave it to Beaver episode, the father is a willing participant in the plagiarism. Still it’s interesting how 2 TV episodes, written 22 years apart, shared so much in common. All in all, The Facts of Life was well known for handling difficult issues very well and its handling of plagiarism was no different. While it took some liberties to keep the plot moving, it provides a good representation of how some good students can get caught up in plagiarism and what the eventual outcome often is. While not flawless, it’s an overall fair representation of the realities of academic plagiarism and one that remains surprisingly relevant today. As we’ll see as this series goes on, this is definitely one of the more balanced and realistic portrayals of plagiarism in pop culture, one that showcases how serious plagiarism is, without attempting to demonize the plagiarist. It’s human, it’s balanced and it’s relevant. It’s just about everything one could reasonably hope for from a story about plagiarism that aired in 1980.